Another trip down to sunny Florida last weekend, this time to defend our conference lead at Florida State University. The trip was long but worth it. We arrived in Tallahassee after 11:30pm on Friday and were happy to find our host house–offered up by longtime cycling friends Jason Snow and Will Thompson–and eat a snack and hit the air mattress. After a solid six hours of sleep, we were up, toasting bagels, and getting ramped up for the weekend’s first event, the TTT. It went well: both the women’s and men’s teams claimed first place in Div II. Then after a brief respite of sandwich-making and suntanning, we got ready for the “hilly” 16-mile loop along the Florida and Georgia border. The first lap for the A men didn’t go so well. Actually, it was a complete disaster. Paul Webb crashed while attempting to follow what would be the winning breakaway and in the effort snapped his chain. He was fortunately rather uninjured, but the accident had caused a disruption in the field that the attacking riders made sure to take advantage of. At the end of the first lap, we only had one rider, Kyle Knott, in the field and no one in the seven man breakaway. Ouch. By the end of lap two, Matt Willing had gotten back on terms with the peloton despite having to stop twice to reseat his chain due to a malfunctioning derailler pulley. Francisco Fuster was also back in the group. Nikola Milanovic never made it back after the crash and settled into a nice, long training day in the sun. As soon a Matt made contact with the field, he recognized the dire situation the team was in and threw down an attack to try to get a group to bridge to the break. But no one followed, and Matt rode the next 45 miles alone, distancing the field but never able to catch the breakaway. By the finish, Matt caught and passed two riders who had been dropped from the break and rode home for an impressive Jens Voigt style finish for 6th place. Kyle won the field sprint for 9th quite handily and Fuster earned enough points for the team in 15th to win the team overall for the road race. Not what we’d planned, but the end result was better than any hopes we’d had after that miserable first lap. Maitland Jones from Tallahassee Community College won the race by outsprinting his breakaway companions, making it look easy in the process. In the Women’s A road race, the field stayed together despite a number of attacks. Klara Rossouw tried one last attack up the feed zone “hill” with about 2 miles to go but she was quickly covered and decided to wait for the group sprint. Coming down the last 200 meters to the line, it looked like Heather Davis from UF had the edge but Klara came back on her just in time and won by inches in an exciting photo finish, bike throws included. At Saturday’s criterium, the A women raced before the A men and again the race ended in a group sprint, but this time up a small rise. Klara timed her sprint to perfection and once again came across the line first ahead of Heather Davis from UF. Emily Fancher from UGA was third. Klara’s dominant performance over the weekend catapulted her into the overall omnium lead, just a handful of points ahead of Davis. The men’s race started fast and furious with lots of attacks, counter-attacks, and attempts to win the sprint primes. A little over halfway through a group of five escaped. Once again, MHC was not represented. Paul Webb attempted to bridge up to the front group with a couple of other riders but got stuck in no man’s land and settled for a strong 7th place finish. Kyle Knott once again, and with the help of a leadout from his teammates over the last three laps, won the field sprint in convincing fashion. After all the points were tallied, Mars Hill now leads the Div II conference standings by a wider margin. MHC has 282 points in the team standings, King College is second with 84 points, University of Central Florida is third with 57 points, and Furman and College of Charleston are tied with 56 points each. In addition, Klara Rossouw leads the women’s division and Paul Webb is now in 3rd overall with Kyle Knott in 7th in the mens’ A overall category. Paul and Kyle are in 1st and 3rd in the Div II rankings. Next stop is Georgia Southern University this weekend, where teams will continue to tackle the TTT, RR, and Crit format. We expect more competition this weekend as more teams seek to gain points for nationals qualification. As always, we thank our sponsors and supporters for giving us the resources we need to race our bikes. Go Green Team! “Race Across the Sky” Comes to the Big Screen for One Night Only. “A Ride with George Hincapie” Completes an Awesome Double Feature. 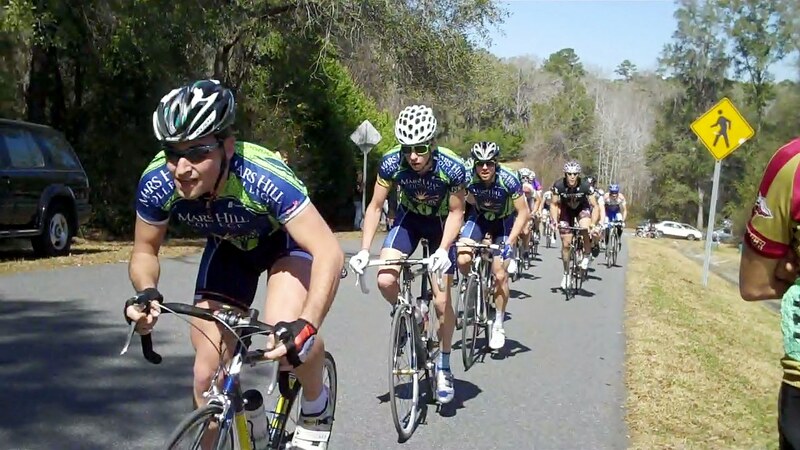 Mars Hill College Cycling in conjunction with Citizen Pictures will show the epic documentary “Race Across the Sky” as a fundraising event for the team. This is your chance to see this visually stunning film on the big screen before the DVD release. The film was released very briefly on the big screen in large cities but never made it to Asheville. Following RATS, we will show “A Ride with George Hincapie” to complete this double feature highlighting two of the USA’s most respected cyclists. Presented in conjunction with Plan A Films and Hincapie Sports. The film was directed by Chusy Jardine, the award winning director, whose film “Anywhere, USA” (based on and filmed in Asheville) won a prestigious Sundance award. The event will be hosted by Asheville Pizza and Brewing Co. on Thursday, March 11th. Tickets: $10 donation at the door. Ticket sales will start at 8:30pm, show at 9:30pm. Get there early as we expect to sell out the 150 seat theater. Our silent auction this year will again feature gear, goodies, and gifts from local businesses. Items listed below. At 10,000+ feet, against the misty backdrop of a former mining town, Leadville, Colorado, 1228 cyclists line the starting line. For many, it will be the most difficult race of their lives. For some, a bragging right to say they raced alongside the best in the world. Some imagine victory. Most hope only to finish. But everyone will count. 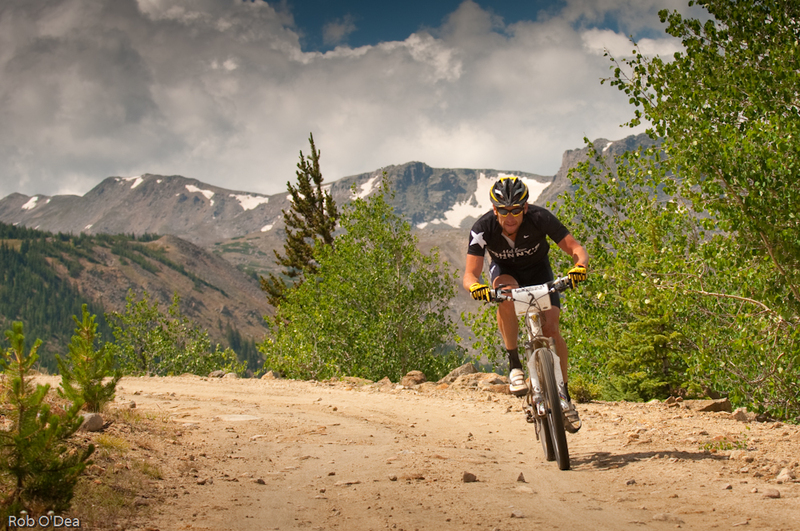 The race that started 25 years ago as a running race to drive tourism in Leadville has now grown to a lottery cap of 1000+ competitors, many of them the world’s most elite cyclists. But the Leadville Trail 100 “Race Across the Sky” Mountain Bike Race is not just a race of man against man: it’s man vs. man, man vs. self, man vs. elements, man vs. time. A clock set for 12 grueling hours slugs through 100 miles, over 14,000 vertical feet of climbing, some two miles above sea level, through extreme climate changes ranging from heat to hail, from rain to snow. To the racers, the risks of injury, fatigue and mechanical failure pale next to the chance that they will fall behind the 12 hour cut off mark and be eliminated. Rivalries include six-time defending champion Dave Wiens vs. international star / seven-time Tour de France winner Lance Armstrong. Inspirational stories of human triumph include a Leadville woman rider who was critically injured by a car while training for last year’s race, another who suffers from multiple sclerosis, and 45+ rider who has raced all 15 years. Whether they’re international stars of the sport or everyday folks with the will to finish a race whose difficulty is on par with the Ironman, the grit to push to their own physical and emotional limits strikes an elegant symmetry between racer and environment and a struggling former mining town whose very existence now relies on the tourism generated by this race. Spanning his early years as a junior to the disappointment of 2009 Roubaix, this unadorned everything-you-ever-wanted-to-know-about-the-guy portrait puts a microscope on the silent man of cycling, George Hincapie. Ride along with George as he shares his joys and inspirations, his fears and frustrations, his anger (or lack thereof), his hopes and dreams, his strengths and weaknesses, and his plans for the future as he gives us a unique peak into his private world. A Ride with George Hincapie is a feature-length film that provides an unprecedented look at the man behind the athlete. And more… Thanks to those who donated thus far! 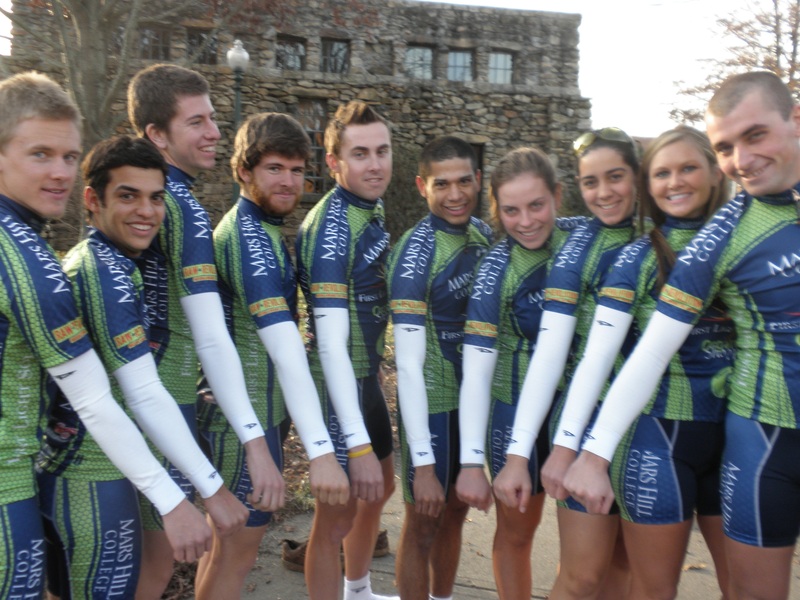 Cycling is a team sport, a fact demonstrated by the eight members of the MHC Cycling “Green” Team who ventured down to Gainesville, Florida, for the first Southeastern Conference road events of 2010, which were hosted by the University of Florida. When all the points were tabulated Mars Hill came out on top and now leads the Southeastern Conference Division II team standings with 92 points. Furman, last year’s conference champion, earned 56 points and sits in 2nd; in 3rd is the University of Central Florida with 36 points; 4th is the College of Charleston with 23 points; and the University of Alabama-Hunstville and Georgia Southern round out the top 5 tied with 7 points each. It was a consistent effort by all members on the team that led to the win. The team did, however, end up with several solid individual overall rankings. In the Women’s A events, Klara Rossouw proved that she is indeed a rider to watch. Not only did she claim two 1st places in the Division II time trial and criterium but she also showed that she can compete against some of the best riders in the nation by being competitive with the Division I women, including two current national champions. Klara finished 3rd to them in the time trial and was the only woman able to follow their attacks in the criterium. Alexis Dabroski from UF won the criterium in a solo attack for the second year in a row, which was impressive and the result of smart tactical racing by the UF women. Klara sits in 4th place overall in the combined Div I and II rankings, which is led by UF’s Jackie Crowell. Rossouw, though, has a strong lead in Division II. In the Men’s A category, Paul Webb and Kyle Knott are now positioned in 2nd and 3rd overall in Division II, but they could not have accomplished this without the hard work and sacrifices of their teammates, namely Matt Willing, Nikola Milanovic, and Francisco Fuster. These latter three took control of Sunday’s criterium race, making sure that no breakaways escaped the field, ensuring that Webb and Knott would have an opportunity to place high in the final group sprint. Spencer Beamer from Furman won the criterium and leads the Division II individual rankings. The Mars Hill men also gained valuable points in the individual time trial on Sunday and also finished 2nd in the team time trial to Furman. In the Men’s C events, Ryan Levander finished 3rd in the time trial and in a 3-way tie for 2nd in the criterium and now sits in 3rd overall in Division II individual rankings. Teammate Yonatan Arnold rode strongly in a supporting role. Brooks Bostick from the College of Charleston currently leads the C category. Full results can be found at collegiatecycling.org/seccc. As always, we are grateful to our team partners who provide us with the support necessary to succeed. This is your win, too. And thanks is also due to a couple of old school UF alumni for hosting us for the weekend. When it’s too hot in FL, you’ve got a place to stay in the WNC mountains. The team will race in defense of its early season lead at Florida State University on February 20-21.